The Ernie Ball P06181 VP Jr. is a rugged volume pedal for active musical instruments such as keyboards, effects, and more. This unit comes with a stereo 25k potentiometer, which provides an even feel. The Ernie Ball P06181 VP Jr. is always ready for road shows. It is made with aircraft grade aluminum enclosure, rugged Vectran cable, long-lasting stainless-steel springs. Dimensions (HxWxD): 2.4" x 3.5" x 10"
The 9V Power Supply features a 3-meter cable that ensures the correct amount of power transmitted to your device. It met UL 5 safety standards and made to last a long time. The power supply powers most effects pedals from BOSS, MXR, Electro-Harmonix, TC Electronic, etc. It can also be used with tip negative keyboards or other electronics that have the same amp requirements and voltage. Get additional Blucoil Guitar Picks when you buy the Ernie Ball P06181 VP Jr. bundle today! OPERATES SMOOTHLY - The Ernie Ball P06181 VP Jr. Volume Pedal contains 25k Ohm resistance that suits musicians running an active signal (e.g. active pickups, effects, keyboards) into the pedal. ALWAYS READY FOR THE ROAD - The P06181 is made with aircraft grade aluminum housing, Vectran cable, and stainless-steel springs. REDUCES FOOTPRINT BY 22% - The VP Jr. Pedal measures at 2.4 x 3.5 x 10 inches. It has all the cool features of the MVP P06182 pedal housed in a smaller enclosure. BLUCOIL 9-VOLT POWER SUPPLY - With the Blucoil 9V Power Supply, you don't have to worry about losing battery life while performing live on stage. This slim AC/DC adapter features center negative and comes with a US plug. 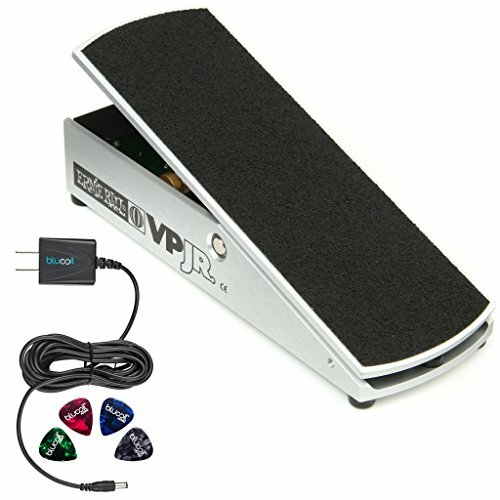 INCLUDES - Ernie Ball P06181 VP Jr. Volume Pedal with 25k Potentiometer for Active Electronics. Blucoil Power Supply Slim AC/DC Adapter for 9 Volt DC 670mA with US Plug. 4-Pack of Guitar Picks.